The South Carolina Department of Transportation has designated Lower Savannah Council of Governments as the Regional Transit Management Agency (RTMA) for the six-county Lower Savannah region. In its role, the Council of Governments serves as a coordination agency for transit services among local agencies providing transportation to the public. As part of its charge, the Council is working to make better use of and to enhance existing transit services and create new services in an effort to make efficient transportation options available to all citizens in the region. Lower Savannah Council of Governments began management of the Best Friend Express system in November, 2004. 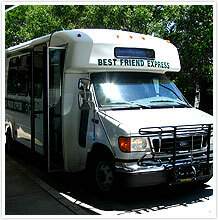 Best Friend Express is Aiken County's public transit service. The green and white buses operate throughout 170 miles of the Aiken urbanized area every Monday through Friday. The routes begin at approximately 7:00 AM and run until 7:00 PM, and are based on 2 hour circular routes. The buses themselves are comfortable "cut-aways" that can carry up to 20 passengers. Also, all of the vehicles are ADA compliant including wheelchair lifts. 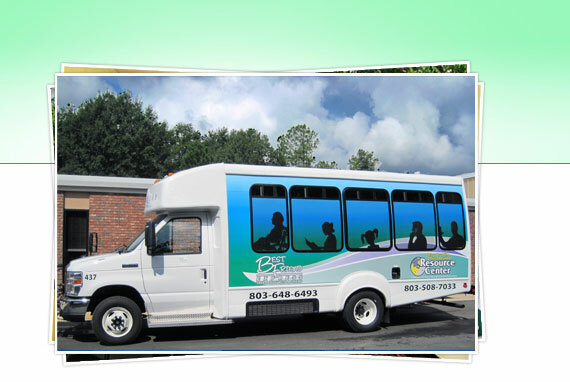 The Aiken routes travel throughout Aiken, with service to Downtown Aiken, service agencies, Aiken Regional Medical Center USC-A, Aiken Tech., and Whiskey Road to Aiken Mall. The North Augusta route is a circular route that travels from North Augusta to Aiken Tech every two hours. The route reaches the City Municipal Building, service agencies, shopping areas such as WalMart and North Augusta Plaza, and travels to Riverview Park. Those riding the system to Aiken Tech can attend class knowing that they will have a reliable ride back to North Augusta or they can travel into Aiken including USC-A and Aiken Regional Medical Center. The bus also connects with Augusta Public Transit, where riders can transfer to the Augusta transit system. One of the best customer benefits for a line as small as Aiken County's is the ability to flag down the bus anywhere along the route, not necessarily at bus stop signs. Passengers can also disembark anywhere along the route that the driver deems safe to stop. ADA Paratransit serves persons with a disability that prevents them from using the regular BFE fixed Route bus service. The service is called Dial-A- Ride (DAR). Dial-A-Ride (DAR) services complement the Best Friend Express regular fixed routes and offer transportation options for anyone traveling within ¾ mile of the BFE route. This service will pick up someone from a location within ¾ of a mile from the BFE route and take them anywhere within ¾ of a mile of the BFE fixed route (in South Carolina). Anyone wishing to apply for this service must complete an application to determine eligibility, (form link) which must also be signed by that person's physician and have a DAR Card issued. One way fares for Dial-A-Ride services are $3.00. Reservations for DAR trips must be made no later than the day before the date for the trip. All of the Best Friend Express busses are wheelchair-accessible with lifts. With proper verification, people 60 and older, those with a Medicare Card or those with disabilities can ride the Best Friend Express for half fare. For a half fare application click here. Arrive at the bus stop a few minutes before the bus is scheduled to arrive. As the bus approaches, signal (wave) for the driver to stop. Please Pay when boarding using Exact Change Only. Drivers Do Not make change. When you want to exit the bus, pull the cord or tell the driver as the bus approaches your destination.